At this time James Starley was foreman of the company and was instrumental in helping to bring about several improvements to the basic velocipede; however, in 1870 he left to set up in business with William Hillman. The first important bicycle they produced was the Ariel, an attempt at making a lightweight all metal machine. Other small firms came and went in the next few years, and in 1873, HJ Lawson made the first safety bicycle in Brighton, followed by the improved version of the Coventry Lever Tricycle, seven years later. Starley’s nephew JK Starley Introduced the modern type of bicycle with a triangulated frame, wheels of the same diameter and chain drives. The bicycle, known as the “Rover” first appeared in 1885. The following year Humber opened a factory in Coventry, and by 1871, 70% of the cycle industry was concentrated in the Midlands. 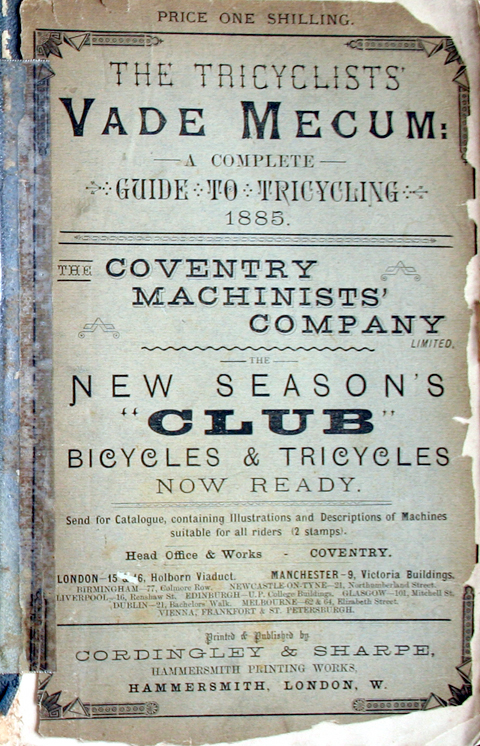 Coventry’s Premier Cycle Company, with an annual output of 20,000 machines claimed to have the largest cycle works in the world, but after 1896 a depression set in, which continued into the twentieth century. Birmingham took over as the centre of the industry, and the number of Coventry firms dwindled to a few well-established ones, such as Bayliss and Thomas, Coventry Eagle, Rudge-Whitworth, Swift and Triumph. From 1925 onwards, competition from the motor industry and new production methods led to a further decline, and Singer, Swift, Riley and Triumph gave up the cycle side of their business. After the war, only two cycle mautacturers were left in Coventry; these were Associated Cycle Manufacturers and Coventry Eagle which survived until the 1950’s. The first was taken over by Raleigh in 1954 and the second moved to Smethwick in 1959. 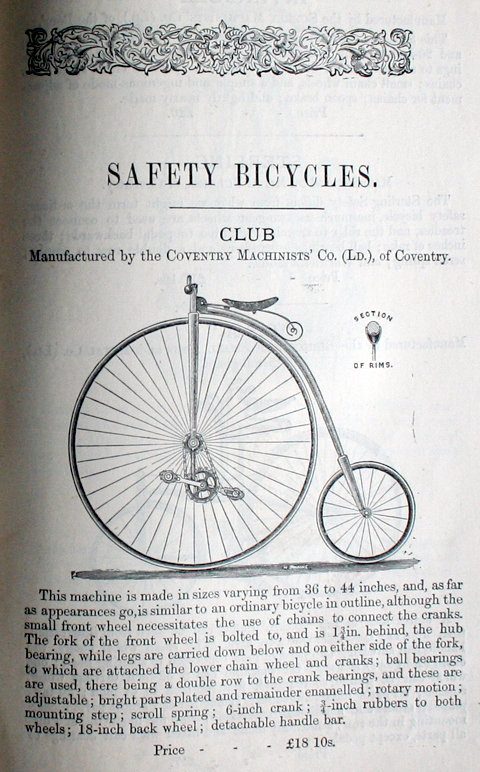 In the 1860s the Coventry Sewing Machine Co was making small numbers of ‘Michaux’ bicycles for the British market. These bicycles could be commercially purchased from M. Michaux, at 29 Avenue Montaigne, Paris for 200 francs. They were essentially the earliest form of bicycle with an added rotary crank, an innovation that Michaux’s company had pioneered. These velocipedes were very popular in France. In 1871, its French agents placed an order of 500 of these velocipedes with the Coventry Sewing Machine Co, which, as a result, reformed itself as the Coventry Machinist Co to handle the order. However, the Franco-Prussian War broke out and the French agent reneged on the order. As a result, the Coventry Machinist Co, subseuqently reformed again as Swift Cycle Co Ltd, created a market for them in England. The Swift Safety advert below is from 1889, and illustrates the company’s American dealership. Coventry is traditionally believed to have been established in the year 1043 with the founding of a Benedictine Abbey by Leofric, Earl of Mercia and his wife Lady Godiva. Current evidence suggests that this abbey was probably in existence by 1022, therefore Leofric and Godiva most likely endowed it around 1043. In time, a market was established at the abbey gates and the settlement expanded. By the 13th century Coventry had become a centre of many textile trades, especially those related to wool. Coventry’s prosperity rested largely on the dyers who produced “Coventry blue” cloth, which was highly sought after across Europe due to its non-fading qualities. Due to its textile trade, by the 14th century and throughout the Medieval period, Coventry was the fourth largest city in England, with a population of around 10,000, only Norwich, Bristol and London were larger. On several occasions Coventry briefly served as the ‘second capital’ of England. firstly in 1404 King Henry IV summoned parliament in Coventry, he needed money to fight rebellion and wealthy cities such as Coventry lent it to him. During the Wars of the Roses the Royal Court was moved to Coventry by Margaret of Anjou the wife of Henry VI. On several occasions between 1456 and 1459 parliament was held in Coventry, which for a while served as the effective seat of government. This came to an end in 1461 when Edward IV was installed on the throne. Due to its importance, in 1345 Coventry was granted a city charter by King Edward III, and in 1451 King Henry VI granted Coventry a charter, which made Coventry a county in itself, a status it retained until 1842, when it reverted to being a part of Warwickshure. During the county period it was known as the County of the City of Coventry. The original city hall is still known as “County Hall” as a relic of this period. In the 16th century due to the restrictive practices and monopolies of the trade guilds, the cloth trade declined and the city fell into hard times. In the 18th century Coventry became home to a number of French immigrants, who brought with them silk and ribbon weaving skills, which became the basis of Coventry’s economy. Coventry began to recover, and again became a major centre of a number of clothing trades. During the 19th century Coventry became a centre of a number of industries, including watch and clock making, manufacture of sewing machines, and from the 1880s onwards bicycle manufacture, which was pioneered by James Starley. Due to this industrialisation Coventry’s population grew rapidly. In fact, one of the first modern bicycles was invented in Coventry. The Starley Safety Bicycle invented by John Kemp Starley and produced by Rover in 1885, was the first bicycle to include modern features such as a chain driven rear wheel with equal-sized wheels on the front and rear. 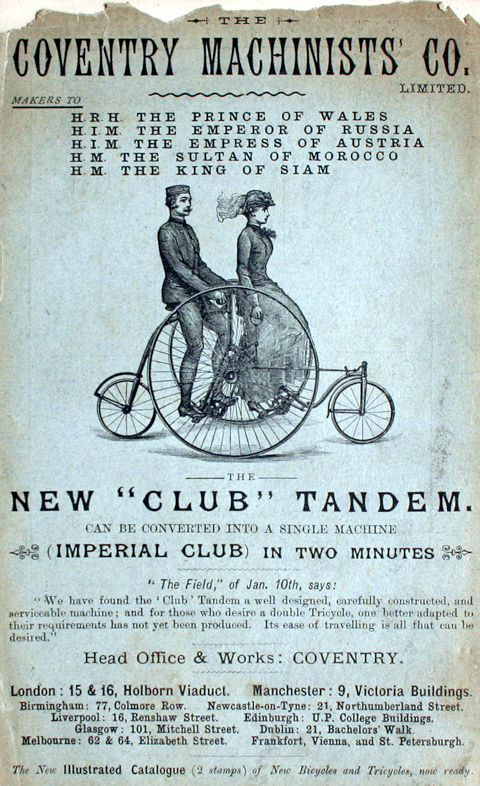 Prior to this, most bicycles had been of the Penny-farthing design. By the 1890s the cycle trade was booming and Coventry had developed the largest bicycle industry in the world. 248 cycle manufacturers were based in Coventry, and the industry employed nearly 40,000 workers. By the 1930s bicycle making had evolved into motor manufacture, and Coventry had become a centre of the British motor industry, Jaguar, Rover and Rootes being just three of many famous British manufacturers to be based in the area. The city remained prosperous and largely immune to the economic slump of that decade. In fact during the 1930s the population of Coventry grew by 90,000. As late as the 1920s, Coventry was being described as “The best preserved Mediaeval City in England”. However the narrow medieval streets proved ill suited to modern motor traffic, and during the 1930s many old streets were cleared to make way for wider roads. On the 25 August 1939, Coventry was the scene of an early mainland bomb attack by the IRA. At 2.30 in the afternoon, the bomb exploded inside the satchel of a tradesman’s bicycle which had been left outside a shop on Broadgate. The explosion killed five people, injured 100 more and caused extensive damage to shops in the area. Five IRA members were put on trial for murder and two were hanged in February 1940, although the identity of the man who rode the bicycle to the Broadgate and planted the bomb was never discovered. The bomb plotters had been operating out of a house at 25 Clara Street. Coming nine days before the outbreak of World War II, the IRA bombing was an omen of what was to about to happen in the City at hands of the German Luftwaffe. Coventry’s darkest hour came during World War II when Adolf Hitler singled out Coventry for heavy bombing raids, due to the fact that it was a major industrial centre providing the manufacture of aeroplanes, tanks, engines and armament. Large areas of the city were destroyed in a massive German bombing raid on November 14, 1940. 568 people were killed, 4,330 homes were destroyed and thousands more damaged in the attack which destroyed most of the city centre and the city’s medieval cathedral. Industry was also hit hard with 75% of factories being damaged although war production was only briefly disrupted with much of it being continued in shadow factories around the city and further afield. The devastation was so great that the word Koventrieren — to “Coventrate” or devastate by aerial bombing — entered the German and English languages. In response, the Royal Air Force intensified the carpet bombings against German towns. On the 8th April 1941 Coventry was hit by another massive air raid which brought the total dead to 1,236 with 1,746 injured. A common myth surrounding the bombing is that Coventry was deliberately sacrificed in order to prevent the Germans knowing that Enigma cipher machine messages were being read by British codebreakers. This has been proven untrue — Winston Churchill was aware that a heavy raid was to take place, but it was not known where, and was expected to be in London.